This ongoing benchmarking workshop series provides an intimate peer-to-peer sanctuary of leadership mentoring and high-level executive debate and discussion of the most relevant issues to you and your firm. NOTE: Workshop fees do not include hotel accommodations. For hotel info and discount code for room reservations, see the workshop registration page. To register, please email Marti Simmons, or call 518-583-9615. You can also register online (see below). 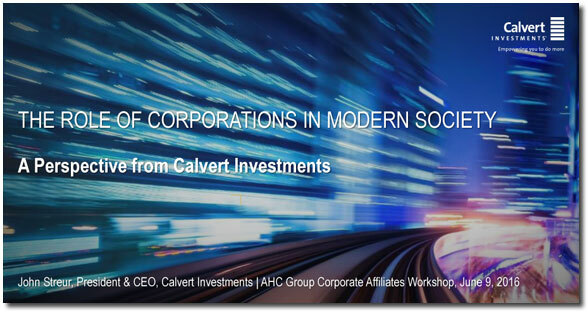 Just as an example of the caliber of our speakers at our workshops, we are offering here as a free download (in PDF format) the Powerpoint of one of our key presenters in June 2016 in Saratoga Springs (John Streur from Calvert Investments). AHC Group always delivers relevant and thought-provoking events in a relaxed and friendly environment. In Phoenix [January 2015], the team succeeded in delivering yet another event full of the latest thinking and ideas that will enable American businesses to become more sustainable and more profitable. How does Bruce do it? Every conference is unique and delivers real insights that enable businesses to transform the way they think about sustainability. If you want to understand the latest sustainability thinking, then their Achieving Results workshop series is an absolute must — it is packed with quality speakers and managed in a unique way that highlights the key learning points. The AHC Group "Achieving Results" leadership workshop series is a process of transformational corporate learning, featuring the experiences and innovations of our Senior Associates, clients, and many of our leading global Corporate Affiliate Program member organizations. This is one of our most popular workshop series, and it fills up fast. We limit the number of registered seats to ensure an atmosphere of engagement and intimacy. For additional information see the workshop session history below. You may also want to read about our Corporate Affiliate Program, or view the agendas for past workshops of the AHC Group. The AHC Group "Achieving Results" leadership benchmarking workshop series is a network of dedicated professionals who seek to learn from other leaders in an educational process that is transformative. This ongoing leadership council mixes AHC Group's distinct set of Senior Associates and our key clients with our Corporate Affiliate Member organizations. The cases we explore are led by those making the decisions and leading the charge. Dr. Piasecki is the active facilitator of the group discussions throughout. This ongoing benchmarking workshop, established and refined since 1990 with over 400 leading firms, provides peer-to-peer leadership mentoring and high-level executive debate and discussion of the most relevant issues to you and your firm. We strive to provide an environment of concrete leadership networking and exchange of best practices in all sectors of industry to reduce risk and create business value.